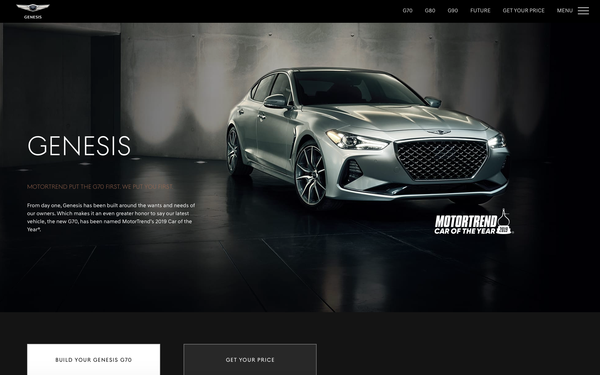 Genesis Motor America is launching two new online tools as part of its newly redesigned website. In conjunction with the debut of the Genesis G70, AOR Innocean took gaming technologies and Instagram Stories and created two new automotive "configurators." The first, a web-based Automotive Real-Time 3D Configurator, can only be found on the updated website, Genesis.com. Here, users can build a virtual vehicle while exploring inside and outside the car, activating animations that emulate real vehicle actions including headlights, sunroof, and dashboard. They can even pop the trunk open. Users receive a summary of their selections and an image capture of their new car build to share. The second, the Instagram Stories Automotive Video Configurator, allows shoppers to build their new Genesis G70 exclusively on Instagram Stories by tapping through a series of pages found at @build.your.g70. The use of Instagram Stories is growing exponentially, but never before have car shoppers been able to use Stories to create a luxury car, according to the automaker. Millennials and Gen Z seek immersive and participatory experiences, which is one of the reasons why gaming and social media platforms, such as Instagram, are so popular with this demographic, says Kate Fabian, head of marketing, Genesis Motor America. Genesis customers expect personalized and innovative shopping possibilities at every level of the car ownership experience, she says. Digital plays a key role in the automaker’s upcoming marketing plans, she says. “When combined with tangible, meaningful experiences aimed at cultivating a relationship that inspires trust and confidence, we are able to shorten the path to purchase resulting in a seamless customer journey,” Fabian says. “Central to all our activity is experiential. We want people to be able to experience our products for themselves rather than us simply tell them how great they are." Innocean led the creative and concept design for the two configurators and the new Genesis.com website. MediaMonks, Acme Digital Content and Digital Giant worked on the WebGL Game Engine for the Automotive Real-Time 3D Configurator on Genesis.com, while Digital Giant provided the CG renders for the Instagram Stories Automotive Video Configurator.